Throughout all of Series 10 of Doctor Who, we’ve been seeing stories where the writers are putting their own points of view and personalities–as well as social issues worth discussing–in the midst of fairly typical adventures. They’ve been great, but following the three recent Monk episodes, it felt good to go back to solid one-off adventures. To do that, the new series’ most veteran writer offered up an episode that perfectly encapsulated his sensibility and loves, as well as keeping step with the socially conscious nature of this year’s best episodes. “Empress of Mars” is a ’70s throwback Doctor Who story using trappings of Hammer Horror; who else but Mark Gatiss would write such a thing? Gatiss is a longtime Doctor Who fan as well as an expert and scholar of horror. On top of being the writer of the very third episode of new Who in 2005 (and eight others since including “Empress”), he also produced, wrote, and hosted a BBC documentary series called The History of Horror and a follow-up film entitled Horror Europa. His cred in these departments is stacked, and his best episodes of Who in my opinion (“The Unquiet Dead” and “The Crimson Horror“) have had to do with horror. For “Empress of Mars,” he’s plumbing a particular kind of Hammer Horror–the Victorian mummy adventure–and superimposing it over a story about an alien race that he himself brought back in 2013’s “Cold War,” the Ice Warriors. Several weeks back, I wrote about Doctor Who‘s long history with horror, and how there are, weirdly, a lot episodes that have to do with mummies. “Empress” isn’t about actual mummies, of course, but it’s impossible to look at the Martian caverns, and especially the hibernating Ice Queen, and not feel like it could easily be happening in Ancient Egypt. A similar kind of iconography was used in 1967’s “The Tomb of the Cybermen” as well, with decidedly Egyptian-looking Cybermen temples and ruins. The difference here, of course, which sets the episode apart from both “Tomb” and others, is that it takes place on Mars, in Victorian times. Put-upon British soldiers, from a time when Imperialism was the only way, forced to live on dwindling rations on a planet that has nothing for them except the vague hope of gold, being used as a means of awakening their Ice Warrior Friday’s leader, completely out of their grasp. While using the trappings of a 1960s Hammer movie, Gatiss sets up a very ’70s Doctor Who–and British, for that matter–dilemma: just because you live in an Empire, does that automatically make your side the right side? This is something that was touched upon a lot in ’70s Who, specifically during the Jon Pertwee years from 1970-1974. A writer by the name of Malcolm Hulke–a notoriously left-wing figure–would routinely write stories like 1970’s “Doctor Who and the Silurians” about an ancient indigenous race wanting to reclaim the Earth for their own and like 1973’s “Frontier in Space” in which some third party is trying to fire up the cold war between Earth’s federation and the reptilian Draconian Empire, who hate each other because the other is different. Gatiss has placed his story firmly in this camp, where the Doctor has the singular quandary of who to help: the Ice Warriors, whose planet they’re on but are vastly overpowered; or the British, who would be slaughtered in a fight but are technically an invading force. Gatiss pulls from another pair of Pertwee stories here as well: 1972’s “The Curse of Peladon” and its (vastly inferior) sequel, 1974’s “The Monster of Peladon,” both of which feature the Ice Warriors. (Alpha Centauri from this episode’s finale also appears prominently in those stories.) Following their initial two stories in the late ’60s, the Ice Warriors in the Peladon stories are much more erudite, a noble race that’s part of a galaxy-wide coalition, and are not at all portrayed as “monsters.” In “Curse,” they aren’t even the villains, but the ones the true villain uses as a patsy due to perception. A tremendous revelation then, and here: while hostile, they’re much more a proud race than horrific threat. “Empress of Mars” isn’t the first story to tackle British Imperialism, but this might be the one that does it the most head-on. 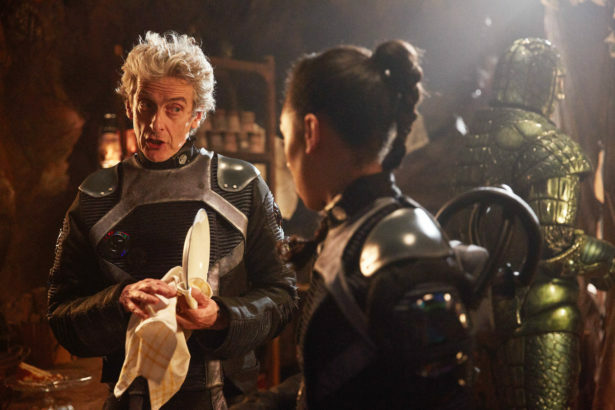 In keeping with the rest of Series 10, here we get the uncomfortable image of an Ice Warrior–a native of the land where the British have arrived–being made to be servant for what amounts to a battalion of hostile invaders. Calling him “Friday” in reference to the character in Robinson Crusoe is a great way to force the reader to realize “Oh, right. It’s a beloved book, but maybe it’s not got the best socio-political messages for today.” That the most staunchly Imperialistic and opportunistic in the bunch is the despicable villain and that the one who brokers the peace ends up being a coward who somehow escaped hanging is great two-finger salute to that outmoded, offensive ideal of Britishness. If you’d have said that this would be a series where the Doctor punched a Regency-era racist and outsmarted a Victorian-era racist, I’d probably have thought maybe they were hitting the message a little too hard, but it’s a credit to the writing and a testament to the sorry state of the world that I’m finding them among my favorites. Gatiss always zigs when you think he’s going to zag, and while I didn’t like his Series 9 episode at all (though having the Martian empress shout “Sleep no more!” to her hibernating soldiers was a nice F-U to people like me), I adore the fact here that he uses a classic alien, and horror movie tropes, to be incredibly socially minded. Before we go, Nardole couldn’t get the TARDIS to go back to Mars so he got Missy’s help… is this the TARDIS or Missy’s doing? My vote is definitely going to Missy, since it’s never addressed fully. We’ll find out soon, I’m guessing! Doctor Who airs Saturdays at 9/8c on BBC America. Let me know what you thought of “Empress of Mars” in the comments below!